Venta | The Air Geeks, reviews of air conditioners, dehumidifiers and air purifiers. Venta is a German air products company that is involved in creating products that enhance a healthy indoor air. The company was founded in 1981 in Germany, though it has manufacturing plants in other parts of the world including the US. Venta produces humidifiers, purifiers, aroma diffusers, or a combination of them. The company’s human resource consists of environmentalists and top engineers in the industry to ensure that quality products and services to the customer. As the world becomes more developed and industrialized by the day, breathing clean air free of dust or pathogens has become very difficult. Since most of us spend the better part of the day indoors, it is possible to control the air we breathe while indoors to make sure it is clean and in the right humidity. Venta has experience in this field owing to the wide array of different products for different needs it offers. It also replacement services for all kind of parts including filters, motors, power adapters, and water tanks. Its lightweight in quality has enabled it to gain popularity and recognition. It recently was awarded the Reddot award winner in 2017 for excellence in air quality. Air purifiers from Venta have industry-leading features such as interactive screens, remote control access and WIFI capabilities that ensure purified optimal comfort. With its patented cutting-edge technologies such as Hygiene Disc and VENTAcel Nelior Filters, air care has been taken to a totally new level. They are some of the quietest and most powerful on the market and also do not produce ozone or ions, unlike many other purifiers. Venta produces an array of different humidifier models. Unlike traditional humidifiers that force air into the atmosphere making it carry bacteria into the atmosphere, this company’s humidifiers use a special disc-stack technology that ‘washes’ the air and makes sure dust particles, bacteria, and white dust do not leave the humidifier with the mist. The disc stack unit consists of rotating disks that pulls the air and removes pollen, dust particles and bacteria and thus ensuring users do not contract humidifier fever. Venta LW15 Airwasher is a 2-in-1 humidifier that also doubles as an air purifier. This ensures air is humidified as well as removing dust, pollen, pet dander and small particles as small as 0.3 microns in size. It has a capacity of 1.4 gallons and able to work for spaces of up to 200 square feet. Venta LW25 Airwasher is an even bigger and more powerful filter-free evaporative-humidifier lightweight unit suitable for spaces of up to 400 square feet. The 2-gallon humidifier is powerful enough to humidify the air, reduce static electricity while at the same time ensuring yo breathe clean dust and bacteria-free moisture. 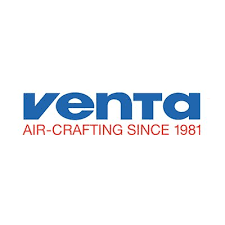 Below you will find our reviews for the best air products by Venta. Thank you for visiting the Air Geeks!